Perhaps because of the complexity of many of today’s devices, wearable technology is often considered something to be bought rather than made. Yet there are endless examples of people employing their own skills and expertise to develop innovative wearables for custom applications. This modified calf halter was created in 1940 by a farmer hoping to simplify and de-stress the process of weaning a calf from its mother’s milk. Rather than the conventional approach of physically separating the calf and mother—which was known to produce a high level of anxiety in both animals—he decided to develop an animal wearable that might achieve the same goal but with less stress. His solution: to fit an off-the-shelf calf halter with outward-facing nails that would prick the mother’s underside when nursing was attempted, thus prompting the mother to kick the calf away and reject subsequent attempts. 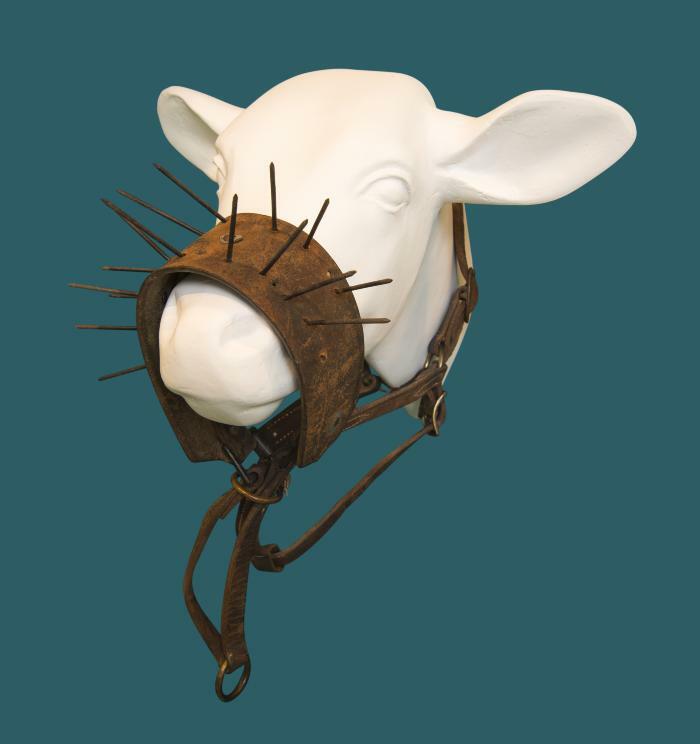 While not exactly pretty, this innovation did represent an affordable and effective means of de-stressing the weaning process, long before commercial anti-suckling devices like the QuietWean (a popular cattle nose tag) became widely available. Made in Ottawa, Ontario, Canada.